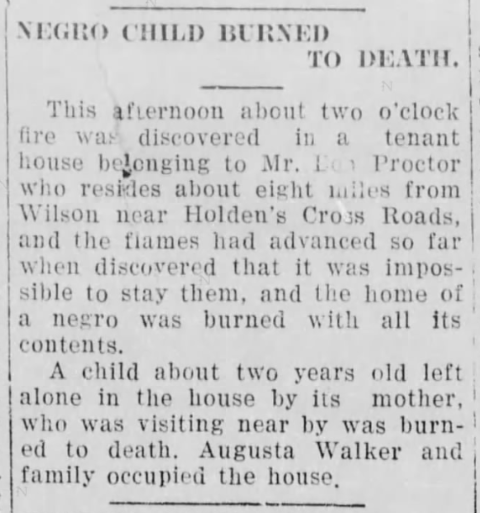 Wilson Daily Times, 13 March 1923. Wilson Times, 14 July 1911. Perhaps, in the 1910 census of Stantonsburg township, Wilson County: Rheubin Ellis Jr., 34, wife Annie, 33, and children Ida, 13, and Albert, 12. Or, next door, Rheubin Ellis, 76; wife Clarkie, 72; daughters Henretta, 23, Joemima, 22, and Cherrie, 19; and grandchildren Amie, 14, Ashley, 12, Rheubin, 11, and Lucy, 11 months. They intended to kill him if powder would burn. Tobe Brooks — in the 1880 census of Black Creek township, Wilson County: farmer Lewis Brooks, 37, wife Lina, 35, and children Lewis, 17, Rachel, 15, Priscilla, 14, Samuel, 12, Abram, 9, Charles, 7, Lee, 5, and Toby, 3. Albert Woodard — perhaps, in the 1870 census of Black Creek township, Wilson County: farm laborer Redick Woodard, 54, wife Agnes, 40, and children Izaih, 20, Harriet, 20, Shade, 13, Parker, 9, Ludwell, 5, and Albert, 1. Or, more likely, in the 1880 census of Black Creek township: Jack Woodard, 35, wife Cynthia, 32, and children John, 12, Julia, 7, Cynthia, 6, Albert, 5, and Aaron, 2. Izerick Brooks — see Albert Woodard, above. John “Jack” Woodard — in the 1880 census of Black Creek township, Wilson County: Jack Woodard, 35, wife Cynthia, 32, and children John, 12, Julia, 7, Cynthia, 6, Albert, 5, and Aaron, 2. In the 1900 census of Black Creek township: farmer Jackson Woodard, 56, wife Fannie, 53, children Daisy, 30, Aaron, 18, Harry, 19, Augustus, 17, Steven, 16, Mary, 11, and Harriet, 8, and grandchildren Eddie, 5, Bessie, 3, and Frank, 6 months. Julia Dora Woodard — see above. Maggie Brooks — in the 1900 census of Black Creek, Wilson County: farmer David Brooks, 45, wife Henrietta, 38, and children Maggie, 18, Minnie, 16, Alice, 13, Lizzie, 11, Bettie, 9, Tommie, 8, and Samuel, 2. Luther Barnes — in the 1900 census of Town of Black Creek, Black Creek township, Wilson County, Luther A. Barnes, 27, white, is listed as a saloon keeper. Charles Brooks — on 9 January 1901, Charles Brooks, 26, son of Louis and Eveline Brooks, married Maggie Brooks, 19, daughter of Dave and Henrietta Brooks at Dave Brooks’ in Black Creek township. Witnesses were P.R. Brooks, Fred Woodard and C.F. Darden, all of Black Creek. Leslie Brooks — Leslie Brooks died 12 October 1918 in Black Creek township, Wilson County. Per his death certificate, he was born in 1881 in Wilson County to Dave Brooks and Henrietta Peacock [see Maggie Brooks, above]; worked as a shoemaker; was single; and was buried in Brooks cemetery. Jno. Williams was informant. Jonas Woodard — in the 1900 census of Black Creek township, Wilson County: Jonas Woodard, 33, wife Edney, 30, and children Anna, 14, Grant, 11, Pauline, 5, Forest, 2, and Victoria, 1. Augustus Woodard — see Jack Woodard, above. H.R. Hoover — the 1900 census of Wilson, Wilson County lists Henry R. Hoover, 36, physician. In 1918, the Atlantic Coast Realty Company commissioned this map of the “old Applewhite Farm” near Stantonsburg. Contentnea Creek runs along the western edge of much of the parcel, and a public road cuts across one end, creating a little pocket of land sandwiched between John Yelverton and Dr. S.H. Crocker’s holdings. The main dwelling faced the road near a ditch at a corner of the property. Across the way, encircled above, were the houses of Applewhite’s tenants, who were mostly (if not solely) African-American. Another cluster of tenant houses appears beyond a row of outbuildings on a farm road running parallel to the creek. 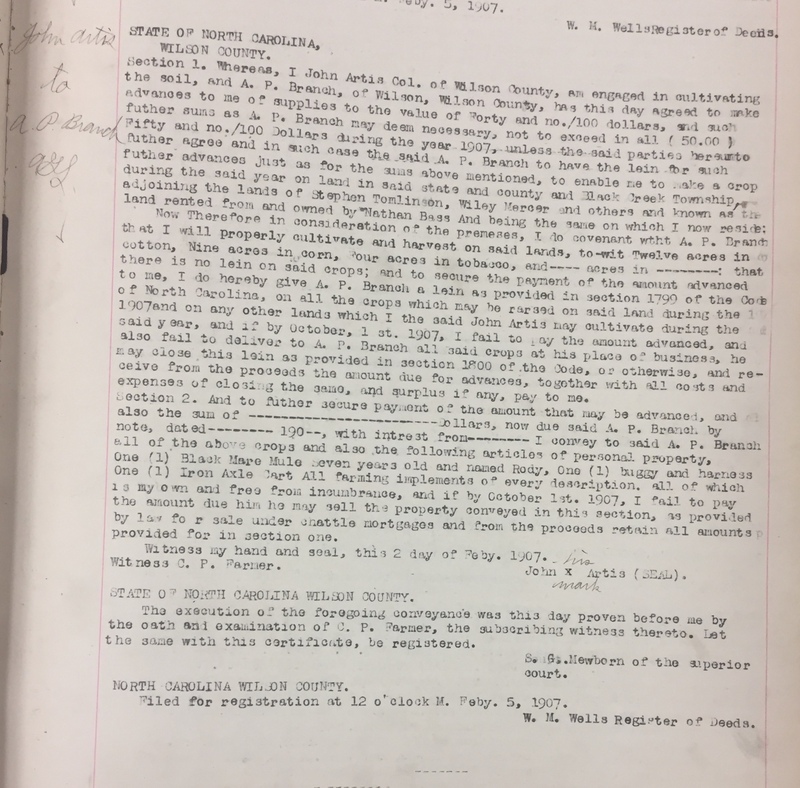 I have not been able to determine which Applewhite owned the property being subdivided, but based on a history of the property, it does not appear to have been William H. Applewhite. Plat Book 1, page 72, Register of Deeds Office, Wilson County Courthouse. He owes my mother $700. Joyners Depot Wilson County N.C. I appeal to you for advice. Please give me the desired advice and tell me what course to pursue and ever believe me to be your obt svnt. Last year my mother rented a farm of B.D. Rice Esqr in Nash County. He (Rice) was to find the team, and Mother the hands and board for them. All went on smoth during the year until the crop was made and housed. When that was done Esqr Rice then refused to settle with her (Mother) fairly and squarely, according to the contract. The business has been placed in my hands to settle and I have tried all ways to settle with him honorably and I can not have it settle neither by law nor a compromise. He (Rice) is now due Mother not far from seven hundred dollars. Please advise me what course to pursue by so doing you would confer on me an everlasting favor never to be forgotten so long as any thing Earthly remains. In housing the crop he would not let her have her part. Joyners Depot is now known as Elm City. Neither Rice nor Pridgen appears in the 1870 federal census of Wilson or Nash County NC. 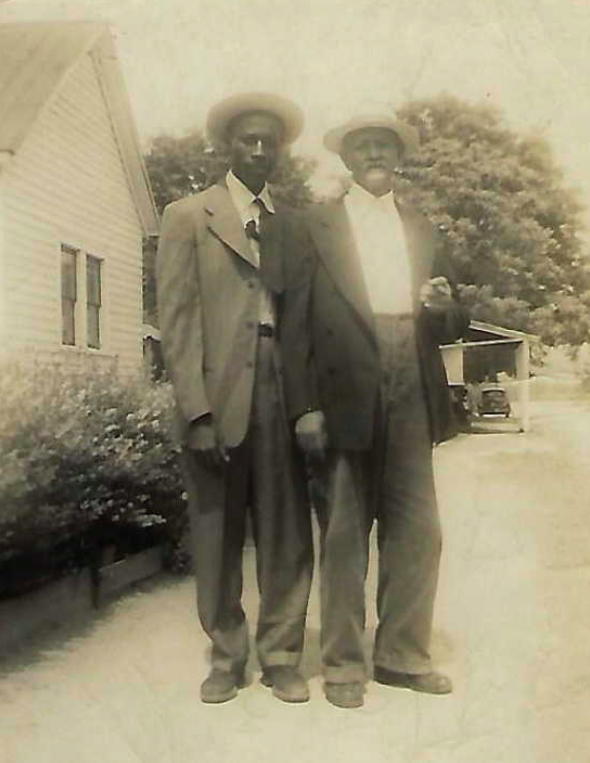 However, 32 year-old Bryant D. Rice is listed in the 1860 census of Winsteads township, Nash County NC. Freedmen Bureau Records of Field Offices, 1863-1878 [database on-line], http://www.ancestry.com. Pittsburgh Courier, 6 August 1938. I’m aiming to get back home and die there. Washington, Monday, February 16, 1880. GREEN RUFFIN (colored) was sworn and examined as follows. By the CHAIRMAN [Daniel Voorhees, Democrat-Indiana]. Question. State where you live when at home. – Answer. I live in Wilson County, North Carolina. Q. How long is it since you left home? – A. It’s about two months now, as near as I can get at it. Q. Where have you been? – A. To Indianapolis. Q. How did you come to go there? – A. Well, sir, there came news about there in the settlement, that if we would all agree to go out to the Western States, to Indianapolis, we could live considerably better out there. Well, it get my head deranged, so I had no sense to make any bargains to work at home, and I said I would go and I would carry my folks; but I didn’t, and I put off and goes myself. Q. Have you a family? – Yes, sir. Q. How many in the family? – A. I have a wife and three children. Q. Did you go with the first party that went? – A. No, sir; I went with the second party. Q. Did you pay your own way? – A. Yes, sir. Q. Do you know how much it cost you to get there? – A. I think it was $15.65. Q. Well, when you got there, what did you do? – A. Well, sir, I done nothing for about two or three weeks. Q. Did you get any work at all? – A. Sometimes I could get some – just a little more than enough to board me and pay rent. I tried every day to get work, except on Sunday. Q. During the two months that you were there how much work did you do? – A. I can’t tell..
Q. Did you work half the time? – A. No, sir. Q. Did you work one day in three? – A. Yes, sir. I worked one week in about three weeks. Maybe I would get a week’s work for a whole week at a time. Q. How much did you get? – A. I got a dollar a day and boarded myself, and furnished my own tools. Q. What sort of work did you do? – A. I was putting in sewers about the city. Q. Did you have to furnish your own shovel? – A. Yes, sir; but they furnished the picks. Q. And you got a dollar and boarded yourself? – A. Yes, sir. Q. Did you find much demand there for work? – A. There was mighty few people there were looking for workmen. Q. Were there a few many or many who were looking for work? – A. There were a great many of them looking for work, for there are plenty of people there as bad off as we were. Q. How much wages were you to get out there? – A. Fifteen dollars a month on a farm, and house to live in, firewood furnished, and a cow and calf to milk extra for each family. Q. Did you find any truth in such statements? – A. None at all, sir. Q. Are you on your way back to North Carolina? – A. yes, sir. Q. Do you expect to stay there? – A. I’m aiming to get back home and die there. Q. You are going to stay when you get there? – A. I am going to stay right at home and advise all the rest to stay. Q. What kind of advice are you going to give them? – A. I am going to tell them, “You have got a home, and you stay there”; for it’s an abomination to go where you have got none. Q. You speak in the church at home sometimes, don’t you? – A. Yes, sir; sometimes in the prayer meetings and round about. Q. Do you expect to speak to them about this thing? – A. Yes, sir; if I live, I expect to tell them about these things. Q. You think it is a great outrage on your race? – A. Yes, sir; it is a regular abomination. Q. You belonged to Mr. Ruffin, who was once in Congress, did you not? – A. Yes, sir. Q. How have you been treated since the war down there? – A. As good as I want to be. Nobody ever bothered me, and when I worked for them they paid me. Q. Did you vote down there? – A. Yes, sir; at every election. I have never missed any one that I know of. Q. What ticket did you vote? – A. The Republican ticket. Q. Did anybody ever keep you from voting it? – A. No, sir. Q. Did you go to court during court week? – A. Yes, sir; I go to see how court goes on and the cases there. Q. Did you live there on the old plantation? – A. Yes, sir; I have a piece of ground there yet. Q. Do you rent it? – A. Yes, sir; I rent from a landholder. Q. What sort of terms do you get? – A. Well, sir, if you tend the lands and they furnish the teams and all the utensils and seed, and I do the labor and board myself, I get a half. Q. Do you make a living for yourself and your family that way? – A. Yes, sir. Q. When you heard of those big wages, you thought you could do better out there than at home? – A. Yes, sir; it’s a man’s duty to do better if he can, but if you don’t like it, why then don’t take up with it. Q. You don’t like it, and you are going back? – A. Yes, sir. Q. How many of your people out there would go back from Indiana if they could? – A. I know of two families, and think they have something of the rise of eight or ten children, who asked us to do something to get them back, and I said I would do my best. Q. And you are going to try to get them back? – A. Yes, sir. Q. How did you get back? – A. I had worked and got seven dollars that I saved; and the man that I was with wrote for money, and they send him $35, and he lent me seven, and with the seven I had it bought me here; and when I got here I had nothing to eat, but I was this nigh home. Q. Did you tell the white people out there you were going home? – A. Yes, sir; I declared I wouldn’t live in their State. Q. Did any of them advise you to stay? – A. Yes, sir; they said they did not blame you immigrants for wanting to go home, but said, you try and stay until after the Presidential election, and then we think it is best for you to go home; and I said all right, and I went on my way and come here. Q. Do you know the men who said that to you? – A. I do not. Q. You have been raised in North Carolina, I believe. Now tell us how you found the weather out there in Indiana for your people? – A. It was too cold, sir. Q. Did you notice a good many people among your emigrants who were sick? – A. Yes, sir; some two or three died in the time. There were little children who were carried to the graveyard and some old ones. Q. So you know this man Perry – Sam Perry? – A. I know him if I see him, but I wasn’t acquainted with him. Q. Did he make speeches down there in your country about this emigration matter? – A. No, sir; I don’t know of anybody making any speeches in Wilson, but when I got to town I found this thing was all through there. I caught hold of it and it worried me so that I got away. Senator BLAIR [Henry W. Blair, Republican-New Hampshire.] I want you to tell me how many people advised you to stay in Indiana until after the election? A. I didn’t take any notice how many – no more than I know this was spoke to us. Q. How many times? – A. Twice. Q. Only twice? – A. Only twice to my knowledge. Q. Were they there in Indianapolis? – A. Yes, sir; right in the city. Q. You have no knowledge of the persons who said that to you? – A. No, sir. Q. And you kept quiet about it? – A. I said all right and walked right on. Q. How many white people did you talk with while you were there? – A. A great many. Q. Did you talk with them probably a thousand times? – A. Yes, sir, more or less. Q. And twice only somebody said for you to hold on until after the election? – A. Yes, sir. Q. You can’t give the names of those people? – A. No, sir. Q. You don’t know but what they were Democrats who wanted you to stay there and vote the Democratic ticket? – A. I don’t know, sir. Q. These Democrats are pretty sharp and up to a great many tricks, ain’t they? – A. Yes, sir; I reckon so. Q. How much money did you have when you started to Indiana? – A. $45. Q. And it cost you something to live on along the way? – A. Yes, sir. Q. Do you know how much? – A. No, sir; I loaned out $8 to a colored man who was going on. Q. Then it must have cost you some $23? – A. I never counted it up. Q. When you got ready to go back, when did you start from Indiana? – A. Thursday morning at five o’clock. Q. This last week? – A. Yes, sir. Q. When did you arrive here? – A. Friday night, at seven o’clock. Q. How did you happen to be here this morning? – A. Well, sir, Mr. Barnes requested of me to stay. The CHAIRMAN. I subpoenaed him, Mr. Blair. The WITNESS. Mr. Barnes requested of me to stay, and so I staid. Senator BLAIR. Did anybody else request you to stay? – A. I don’t know if Mr. Vance [Zebulon B. Vance, Democrat-North Carolina] didn’t say he would like for me to stay. Q. How did you come to know him? – A. Because I was raised with him right there in North Carolina. Q. You say you got work only a third of the time you were out there? – A.Yes, sir. Q. If you had been at home, how much could you have gotten? – A. I would have worked every day if the weather was suitable. Q. You could work all the time there? – A.Yes, sir. Q. Are there any idle people down there? – A. Yes, sir; if they make themselves idle – that is all there is about it. Q. What is the demand for labor? Is it so that the whole colored people there can work? – A. Yes, sir; if they want. Q. From January to January? – A.Yes, sir. Q. Do you work out yourself? – A. I farm, sir. Q. You rent land, do you? – A. Yes, sir. Q. You mean, then, that you can work on the piece of land that you hire? – A. Yes, sir. Q. You don’t mean that your people generally can have labor by the day, every single day in the year? – A. They don’t do much of that kind of hiring down there with us. Q. You mean, then, they can work on their land or land that they hire? – A. Yes, sir. Q. That there are a good many days that you don’t have to work? – A. Yes, sir. There are a good many days when you won’t have to work if you are up with your business. Q. And it is in that way that you mean that you have work every day in the year? – A. Yes, sir. Q. A man can do that in Indiana, can’t he? – A. I didn’t inquire about that. Q. When you got there you didn’t have any such work as that to do? – A. No, sir; I didn’t. Q. But you got a chance to dig sewers in Indianapolis? – A. Yes, sir, I struck it for a while. Q. That is not good work for farmers to do, is it? – A. No, sir; but they tell me they don’t have any use for farmers much until about March. I went round for about ten miles from the city all round. Some of them said they would take me in March, but I said I couldn’t be there in March. They asked me where I was going to be. I said I reckon I would be dead if I staid there, for I must have something to eat between this and March. Q. Yet you say you accumulated $7? – A. Yes, sir; but that’s nothing to what I would get at home. Q. You don’t think you had the chance out there that you have at home? – A. Not the beginning of the chances. Q. Isn’t it a fact that a good many colored people have got chances to work, and have scattered out among the farmers and are doing well? – A. Well, sir, some of them have, and if they don’t like it they say they do. Q. If they don’t like it they say they do? – A. Yes, sir; I don’t see how they liked it though, when they say they can’t get work and are about fit to starve. Q. You think they don’t tell it, then, as it is? – A. No, sir; I don’t think so, because I could see their conditions myself. Q. At the same time they seem to like it better than North Carolina? – A. Yes, sir. Q. And you saw many men who have families, and who want to get back home? – A. Yes, sir; they told me. Q. And these are the only ones you know who want to get back? – A. They are the only ones who told me so. Q. You are a preacher, and a sociable sort of man, and you go round among them a great deal at Indianapolis? – A. I didn’t have anything to say of the Scriptures among them. Q. You saw them and talked with them, though? – A. Mighty little; I talked mighty little myself. Q. But you saw most of them and talked with them? – A. I couldn’t say that and tell the truth. Q. But you saw a good deal of them? – A. Yes, sir; I saw a good deal of them. Q. And two of them said they wanted to get back? – A. Yes, sir. Q. Well, you seem to have a good deal of feeling in this matter? – A. Yes, sir; I have. Q. And you want to get back home and die there? – A. Yes, sir. Q. But you don’t want to die right away, do you? – A. I hope not, but I am going to tell them not to go out there to Indiana; I ain’t going myself no more; but I shall not pester them if they want to go and find out for themselves. Q. You think they have a right to go if they want to? – A. Yes, sir. Q. They have the same right to go to Indiana as a white man? – A. Yes, sir. Q. Did you talk with the white people out there much as to whether they thought the colored people ought to go there? – A. No, sir. Q. Did you see any politicians out there, and talk politics with them? – A. I don’t talk politics with anybody if I can help it. Q. Why not? – A. I don’t believe in taking up too much time with that sort of stiff, and if I can get labor and get my money for it, I rather for that. Q. But the question is, did you talk any politics out there? – A. Not unless somebody attacked me about it. Q. Did anybody attack you with it? – A. I told you that gentleman did, who asked me to stay until after the day of the election. Q. Were there any others who talked the merits of the political question with you; argued with about it? – A. Not that I can remember. Q. Those two Republicans or Democrats told you to stay until after the election? – A. I didn’t know whet their politics were. Q. Didn’t they tell you you would have an easy time when it came spring? – A. Some did and some did not; some of them said it would be the same thing all the year. Q. Some of them said it was better for you to go out? – A. Yes, sir. Q. You don’t know whether they were Republicans or Democrats? – A. I am certain there were two of them were Q. Republicans; they were the same two who sent off my letter. Q. They were Republicans? – A. Yes, sir. Q. They were not anxious, then, for you to stay? – A. They were Republicans, and they said I had better go back. Q. They advised you to come back home? – A. Yes, sir. Q. Were they very strong Republicans? – A. I don’t know, sir. Q. Were they good looking men? – A. Yes, sir; they looked like intelligent men. Q. And they advised you to leave Indiana? – A. Yes, sir; they thought it best, as they said we were most on to starvation. Q. These people who go out there didn’t take money to buy land, and so they have to work and earn some before they can make any purchases? – A. Yes, sir. Q. If a man went to Indiana with three or five hundred dollars in his picket he could do as he pleased, could he not? – A. Five hundred dollars wouldn’t go far with there to buy land. Q. How far would it go in North Carolina? – A. A right smart piece. Q. It wouldn’t buy much in Raleigh would it? – A. Well, sir, I haven’t been there since I was a boy. Q. Well, $500 wouldn’t buy much in a city? – A. I think not. Q. And wouldn’t do so in Indianapolis? – A. No, sir; I don’t suppose it would. Q. Suppose you were to go out in the unsettled parts of Indiana as in North Carolina, then it would go pretty far, wouldn’t it? – A. I can’t keep up with you about that; I have not any experience of it. (By the CHAIRMAN.) Mr. Blair has asked you if you believe it is right for a man to go anywhere in this country that he pleases, and you said you do think so. Do you think it is right to be induced to leave your home and go away where you are not known, and where you cannot get work, by means of falsehoods and misrepresentations? – A. No, sir. Q. You don’t think a man ought to be induced in that way to go where he would be worse off? – A. No, sir; I don’t think so. Q. You think that has been done in this case? – A. Yes, sir; with me and all the rest. Q. And that is the feeling of the colored people towards this man Perry? – A. The feeling, so far as I presume of it, is great dissatisfaction with him. Green Ruffin, age 36, appears in the 1870 census of Wilson township, Wilson County, with wife Tamer and children Ora and Martha, plus 58 year-old Nicey Watson. (N.B. David Ruffin and family lived next door; the two may have been brothers.) In 1880, Green, with age listed as 52, is in Wilson township, Wilson County, with Tamer and children Orah, Martha and Stephen. His former master was United States Congressman Thomas Ruffin of Franklin County, North Carolina. Senate Report 693, 2nd Session, 46th Congress. Proceedings of the Select Committee of the United States Senate to Investigate the Causes of the Removal of the Negroes from the Southern States to the Northern States. U.S. Congressional Serial Set.